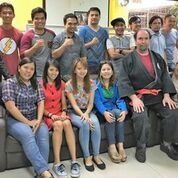 On a recent business trip to Manila, Caulfield Sensei visited the RT Lawrence Corporation, a multi-national financial s oftware company. 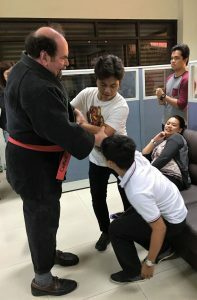 When management learned that Mr. Caulfield is an instructor in “Black Sword Aikido,” a martial art that focuses, not on striking an opponent, but rather on re-directing the opponent’s energy to gain control over them, he was invited to train some of the corporation’s employees in self-defense. About twenty individuals, most with no prior martial-arts experience, took advantage of the opportunity. Some of the women told Mr. Caulfield that they had previously felt helpless because of their size, but after just ninety minutes of training, they now felt more confident that they could defend themselves. The word “Aikido” means “The Way of Harmony of the Spirit.” As taught by Mr. Caulfield, aikido is a way of strengthening one’s mind, body, and spirit, learning one’s true will, and discovering one’s purpose. Mr. Caulfield, a 5th Degree Black Belt in Ueshiba Aikido, has a dojo in Lyndeborough, NH, where he offers regular lessons. Visitors are welcome to observe or sample a class at no cost.